Who Else Wants Insider Secrets and Tips to Writing Performance Review? ...Then follow these 10 steps when writing performance review and have a great review! Getting a great employee performance review is closely linked to your career... You can either leave it up to the system to deliver just another review or you can do something about it to make sure you get at least a decent review. In most companies employees are asked to provide input into their own reviews. 1. Start with the end in mind - when writing performance review this is the best place to start. What do you want to achieve from the review? What is most important? Are you interested in getting good feedback about your performance or is it more about your career next steps? These are important considerations that you need to think of in advance and prepare. 2. Understand the process and the system - this is about getting a good handle on how the employee performance review or performance management system works in your company. Is it a 360 performance review system or a more traditional system? You got to know the rules of the game if you want to play and win! Who does what, when and how are things you need to find out. Do you get to have a say in your review? If not, then how do you get to have a say? 3. Collect achievement data - if you are going to have a say in your review then you have to collect facts about your performance - i.e. your achievements right throughout the year and present them in a logical manner. Here is where you get to really sell yourself and your achievements. Make the most of this and you will be better prepared when writing performance review for yourself. 4. Write your draft review - you have collected your facts and now it is time to write your review. First, make sure you are using the latest format or form. Follow the instructions and write it in a way that brings out your achievements clearly. Pay particular attention to the words and phrases you use to clearly and effectively communicate your review. Summarize your strengths and what you have learnt during the year. If your company system does not require input from you for your manager when writing performance review then find a way around it! 5. Give your draft review to your manager - once you have written up your draft review you need to give it to your manager. What do you say when you do this? How do you pre-empt any concerns or issues in advance? What can you do to be better prepared for the discussion? If you ask the right questions you can find these out in advance. 6. Prepare for the discussion - now that you have some idea of how the discussion might go it is best to prepare when writing performance review. You can use this time to think and write down the key messages you want to deliver. Also, what questions do you want to ask? And, what feedback can you give to your manager if asked for it? 7. Have the discussion - the big day has come. You are all ready for the performance review discussion. How do you prepare yourself for it? What questions related to your career must you get answers for? How do you want to finish the discussion? 8. Anticipate how you will handle tough situations - these often arise from time to time. What if you don't agree with something? Or, something really unexpected happens? It is better to think about these situations than be taken by surprise. Handle them well and you will come out stronger. 9. Follow up - the discussion has finally taken place after writing performance review. Now what? What are the things you need to follow up on? There are things to consider and reflect on particularly as you prepare for the next year. 10. Celebrate - something we forget but a must. Another year is over and you have had a good review. It is time to celebrate and reward yourself for all the hard work. Have fun! Want to make the most of this article? Then get the Performance Review eBook + 50% discount + 5 Free Bonus Offers - Hurry Limited Time Only! 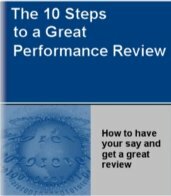 Performance Review eBook + 5 FREE bonus offers!